Rachel Griffith. She was one of the first chefs to share her talent and enthuasium so I am honored to share the day with her. 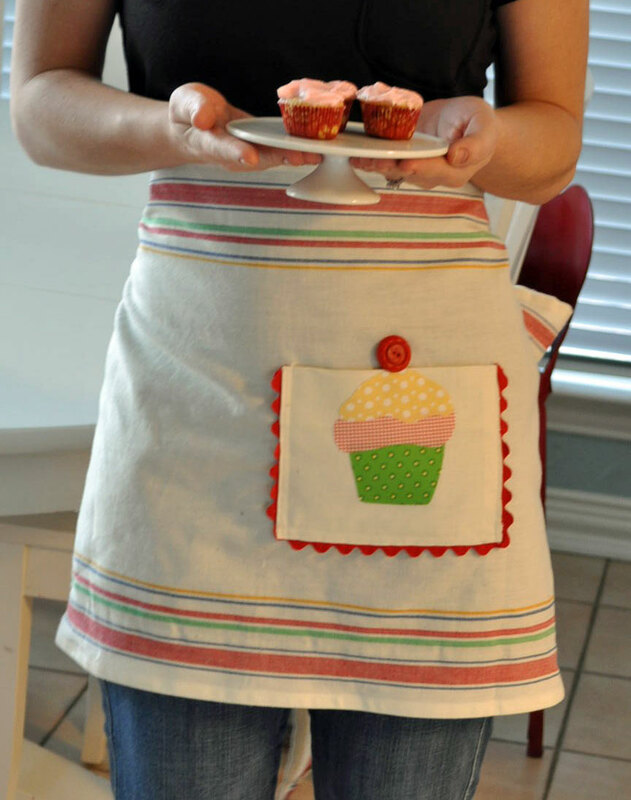 cupcake tea towels and apron. Most likely if you were coming to my home, we would all gather around the sewing machine and create some yummy projects while the men whipped up something on the grill. My parents taught all us kids to be comfortable in the kitchen or with a set of power tools, so there are no stereotypical roles in my household either. My son is cooking wings as I type this post. Toweling, charm squares, soft and stable fuse, buttons, and trims. Choosing what to use is just like choosing what to add to cupcakes. There are so many choices. Trace the template pieces on the fusible interfacing. Iron them to the wrong side of the fabrics. Cut the shapes out. Please them on tea towel and iron in place. 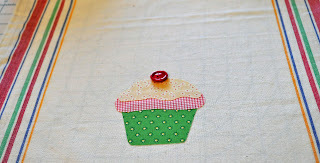 Click here for cupcake templates. Hem top and bottom of toweling 1″. 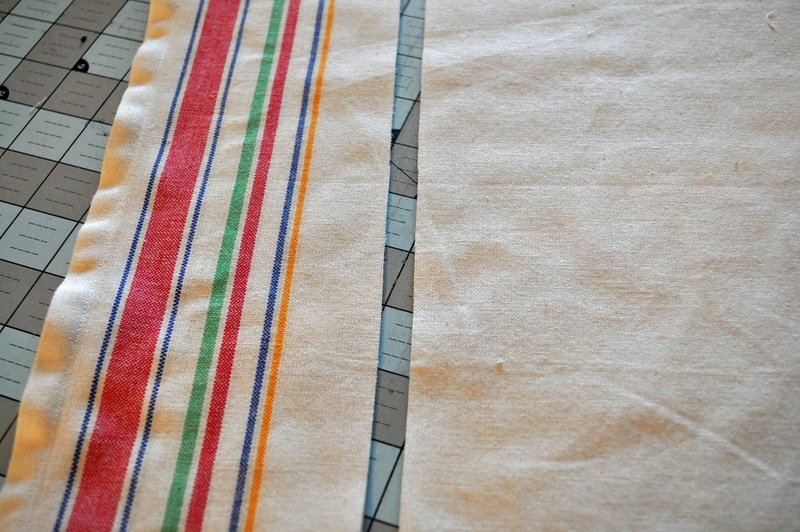 Press edge .5″, fold up again, press and stitch to create the 1″ hem. Use a red button for the cherry on top. Make covered buttons using the I-top button making tool. to hang the towels. 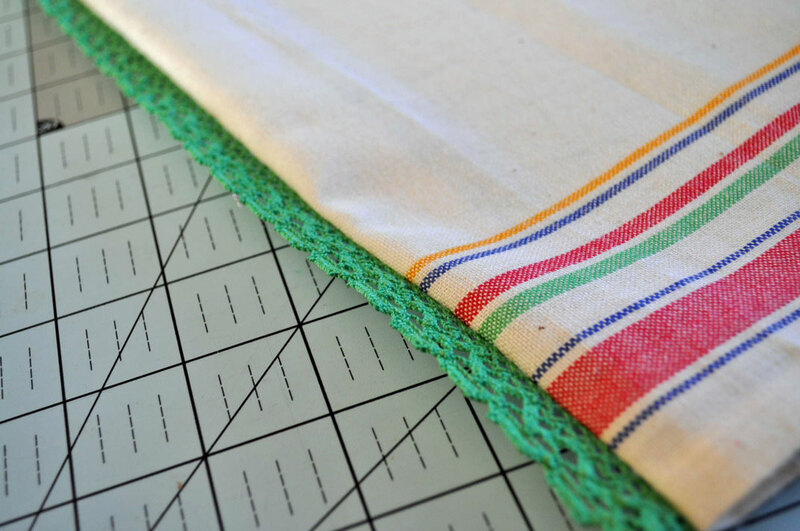 (see below) Determine how big of loop you want and add it as you hem to top section of your towel. To add an edging to the bottom you your towel, sew it right sides facing to the top of the towel. 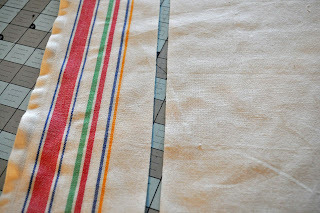 turn the edging down as you hem the bottom of the towel. This works on the crochet trim and ric rac. Some of the trims can be sewn directly to the top of the towel. 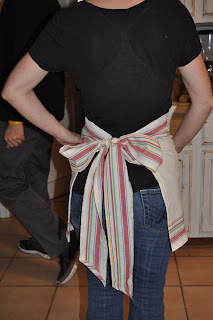 The toweling can also be used to make a cute half apron. 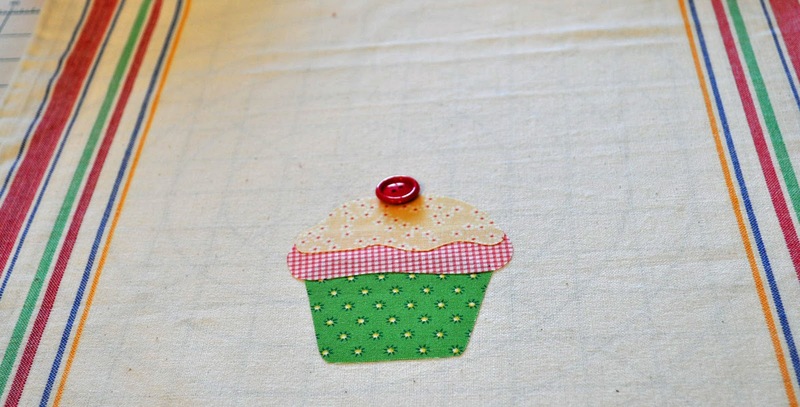 Determine how wide you want the apron to be. Add apron ties as listed below. 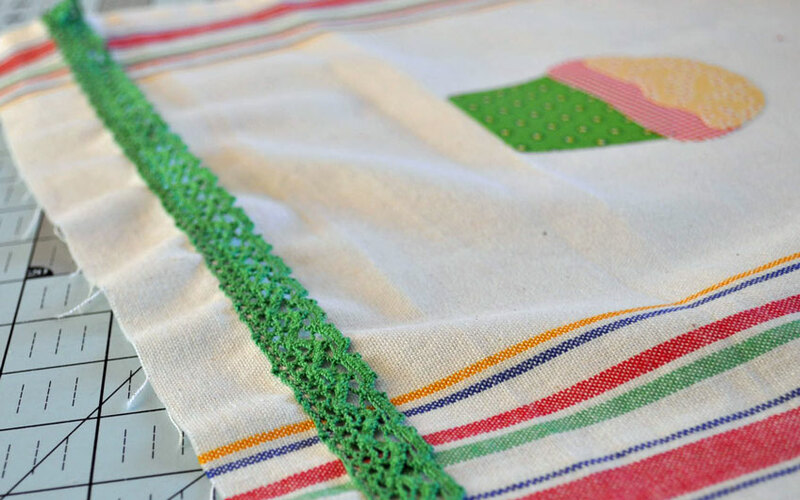 Trims can also be added to the hem on the aprons. I added ric rac as I sewed the pocket onto the apron. You will need to buy double this amount. The additional yardage will be used to make apron ties. Cut the stripe from the toweling for apron ties. Hem and add to the sides of the toweling. Using the additional fabric, cut pocket square. 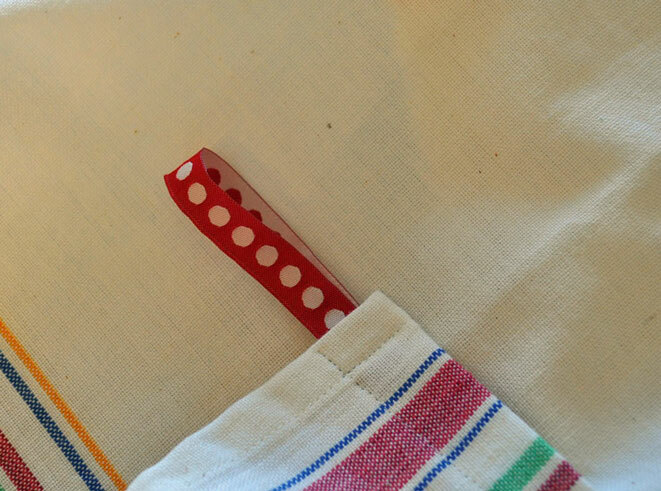 Add a cupcke to the pcoket placing it along the top of the pocket. Add a ribbon loop when sewing the pocket in place. 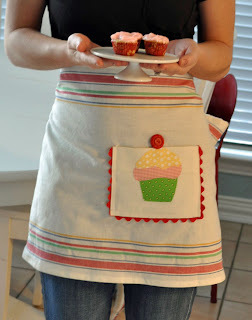 Sew a button on the apron and use the ribbon loop as a button closure. Now that I have a cute apron to wear I had to put it to use in the kitchen. Combine all above ingredients. Mix together approx 2 minutes. Fill cupcake holders 3/4 full. Bake approx 10 minutes. Cool and frost. 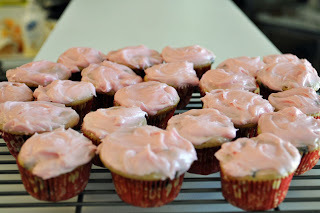 I made mini cupcakes because these are sinfully rich and delicious. If making as a cake, grease 9 x 13 pan and bake for 25-30 minutes. Soften cream cheese and margarine. Blend until creamy. Add vanilla and powered sugar. Use food coloring paste (not liquid) to add color to frosting. Decorate as desired. Tomorrow visit Julie Herman and Sweet Water, then …. The last stop on the progressive dinner is Jenny Garland and Angela Yosten. These are the two talented ladies that keep the Moda bake shop’s pantry full of projects for you to enjoy. 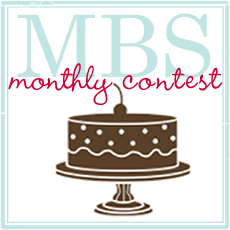 I am sure you have read about the giveaway on each of the other chefs posts. By now you should know that by memory. My favorite precuts IS ALL of them (another middle child trait) but I will choose jelly rolls. 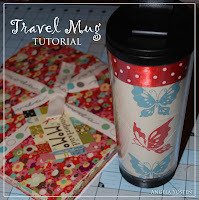 I like combining a print jelly roll and a Bella solid jelly roll for a bigger project and a different combination. So you know the drill, leave a comment on my blog to win precuts of my choice and a Fresh Fabric Treats book. 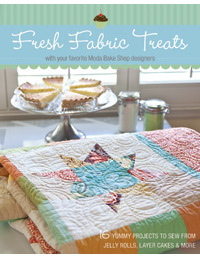 In the past moda bake shop has featured stores, projects and even recipes. If there is anything you want more of on the bake shop, please leave it as a comment. Follow me on twitter or stay tuned to my blog for insider Moda information as well as random ramblings from a middle child. Leave a comment on all posts to be entered in the grand prize drawing. PLEASE PLEASE PLEASE make sure you have an e-mail address, so we can contact you if you are the lucky winner. Moda’s Progressive dinner starts today. Do you have your knife and fork ready? You will not want to miss one tiny morsel. 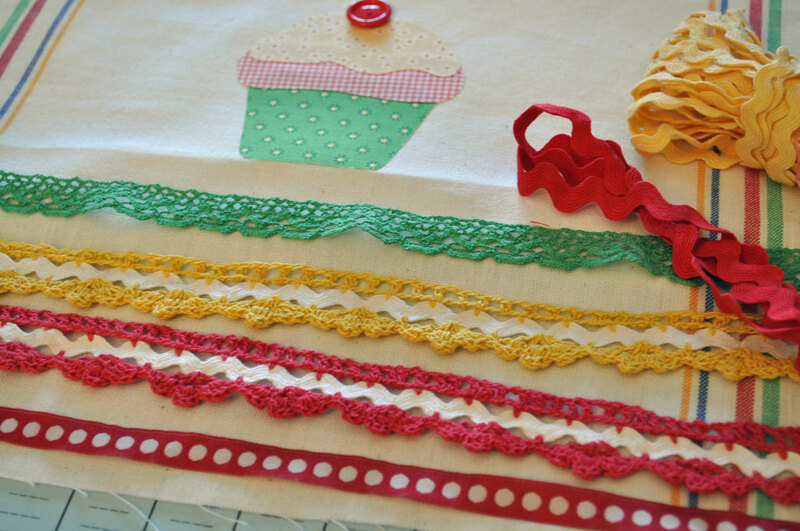 upcoming book, Fresh Fabric Treats. Meet Amanda Jean Nyberg. She is one crazy mom. Vanessa Christenson will delight you. John Adams is the loveable Quilt Dad and one of the authors of ezine Fat Quarterly. By day she is known as mild mannered Monica, but in blogsphere she becomes the Happy Zombie! Kimberly Walus is like the Doublemint Twins. She has two projects in the Fresh Treats book. 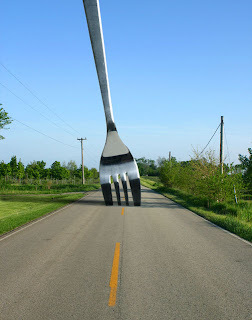 Then stop by polkadotchair.blogspot.com to hear what Melissa Mortenson has to say. and don’t head straight for the desserts. Rachel Griffith has more energy than anyone I know. without making a mess.” So I am sure she has great things on her plate. ovens on at the Moda Bake Shop. Winners for each of the individual drawings will be annouced at the end of the Progressive Dinner. Anyone hungry? 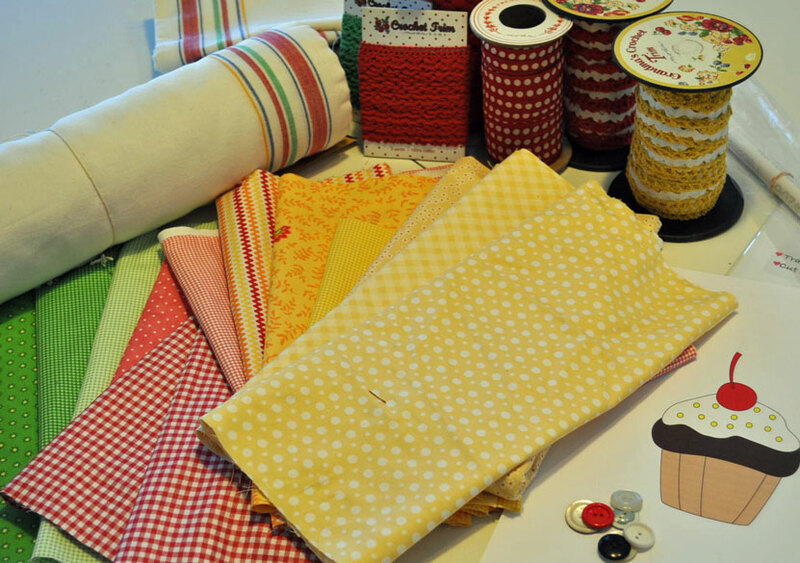 for fabric that is…. Stash Books and Moda Bake Shop has joined together to create a “filling” book by a few a the moda bake shop chefs. 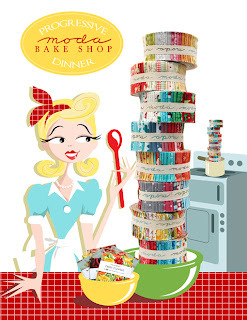 If you are a fan of the the moda bake shop, you will want to join along in the progressive dinner blog hop Jan 19th through Jan 26th. Each day meet 2 of the contributing authors, find out their favorite moda precut, and learn other tasty bits from each of the chefs. Each chef would love to have you come to their home for an actual progressive dinner, but there is not enough room to park in the driveway. 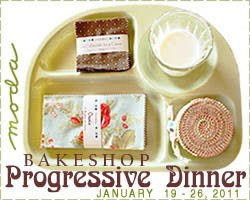 SO, find out how we will be sending you part of the progressive dinners to your home. Visit the first 2 stops January 19th. blog, facebook, twitter. The more the merrier!